Explanation: This striking line of 13 closely spaced craters on Jupiter's moon Ganymede was photographed by the Galileo spacecraft in 1997. The picture covers an area about 120 miles wide and the chain of craters cuts across a sharp boundary between dark and light terrain. What caused this crater chain? 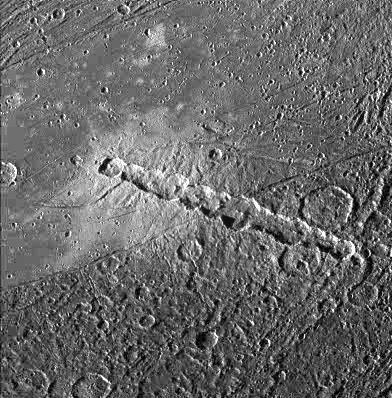 Remarkably, the exploration of the Solar System, has shown that crater chains like this one are not unique, though they were considered mysterious until a dramatic object lesson was offered by comet Shoemaker-Levy 9. In 1994 many denizens of planet Earth watched as huge pieces of this torn comet slammed into Jupiter itself in a spectacular series of sequential impacts. It is very likely that similar torn comets from the early history of the Solar System are responsible for this and other crater chains.